This is Part 2 in our Law Review Data Series. Click here to read Part 1 of the series or click here to read Part 3. Following up from the first data post in this series, I wanted to look at a feature that is unique to law reviews within the larger academic publishing space: expedited decision requests. For those not familiar, law reviews allow authors to simultaneously submit their article to multiple journals at once, and as they receive publication offers the authors can share that with other journals (most commonly higher-ranked journals) in the hope of getting additional publication offers. Publication offers have a deadline, and expedited decision requests (“expedites”) also have deadlines which generally match the publication offer deadline (e.g. I receive an offer that expires in a week, so I tell better ranked journals that I would like a decision from them within 1 week). Note: I’ll use the terms “submission” and “article” interchangeably. When do authors submit expedited decision requests? As one might expect, expedited decision requests track when articles are submitted, but are generally delayed by about 2-3 weeks. 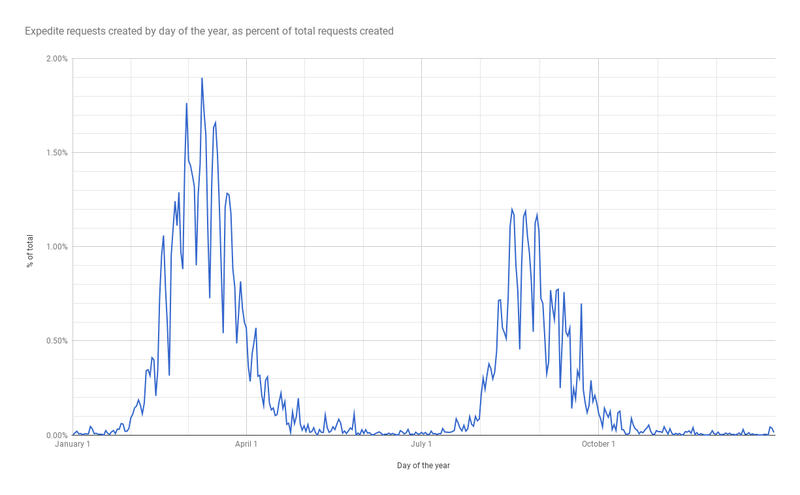 When compared to the submissions graph in the first data post, while submissions have dramatically died down by mid-March, expedited decision requests are still being created at a noticeable clip into the first week of April. This makes sense given that law review editors need time to read papers and make publication offers, and authors need time to create expedited decision requests. How long are deadlines for expedited decision requests? Law review editors give varying deadlines for authors to accept publication offers, ranging from same-day to multiple weeks, and these deadlines are reflected in the expedite request deadlines authors send to other law reviews. 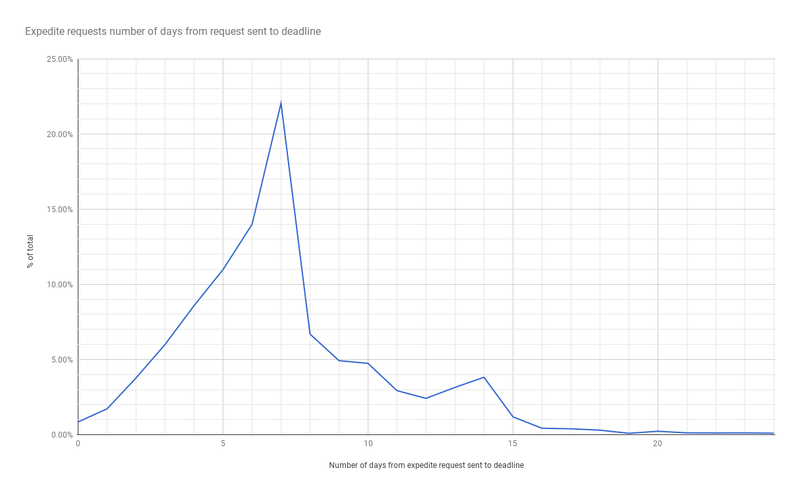 The next chart shows the distribution of days from when an expedited request is sent to the corresponding deadline. Approximately one-third of all expedite requests have a deadline 6-7 days from when the request is sent. Another third gives 1-5 days, and the remaining third are 8-20 days (only about 1% of deadlines expire within 24 hours). How many expedites do authors send? As a law review editor, on average half your submissions will submit no expedited decision requests, and for the other half 87% of those will have 1-3 expedited decision requests. 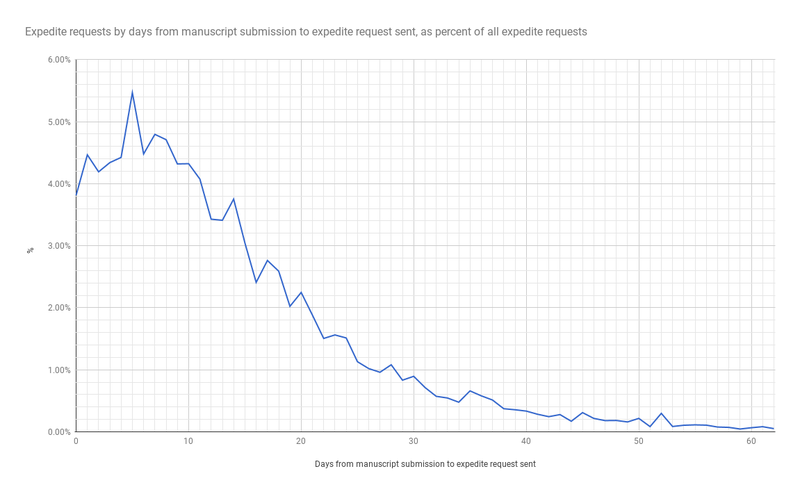 And given that there are 0.91 expedite requests per article, this means that there are almost as many expedited decision requests sent as manuscript submissions! How quickly do authors send expedited decision requests? Relative to when an article is submitted to a law review, when should an editor expect to receive expedited decision requests? I was surprised that while the first week after submission is busier for expedited decision requests, the second week is only marginally less busy. Even the third week is only one-third less active than the second week - though after the third week new expedited decision requests dramatically decline. If you missed it, make sure to go back and check out Part 1 of the series. You can also click here to read Part 3. Which Law Reviews are Open for Submissions on Scholastica? Want to know which law reviews are open for submissions on Scholastica? Check out the interactive table to search and sort law reviews by name, category, and whether or not they're open.